SPOILER ALERT: The following article contains massive spoilers for David Yates’ Fantastic Beasts: The Crimes Of Grindelwald. Read at your own risk! Following up with the characters introduced in its predecessor, David Yates’ Fantastic Beasts: The Crimes Of Grindelwald makes some bold moves with its characters. And while there are some shocking developments for all the heroes, none of them compare to what unfolds for Credence Barebone. He learns something pretty stunning in the final moments of the film, and as you might imagine, it left star Ezra Miller completely blown away — as you will discover by clicking play on the video below! There has been tremendous secrecy surrounding the major reveals featured in Fantastic Beasts: The Crimes Of Grindelwald, but I got Ezra Miller to talk a bit about the big one for his character during the Los Angeles press day for the film earlier this month. He was hesitant to answer at first, calling out to publicists behind the camera for permission, but eventually just dived into it, noting that he went a bit crazy when he learned about what is being set up for Credence in the future of this franchise. The reveal I’m referring to, of course, is the fact that Credence Barebone — who has never known anything about his parents — is actually a member of the Dumbledore family. This information is shared with the confused young man shortly after he decides that he is going to follow Grindelwald (Johnny Depp) and his dream of wizard supremacy, and demonstrated with the help of a phoenix. It’s noted earlier in the film that there is a strong connection between the Dumbledore clan and the fiery birds (as demonstrated by Albus’ relationship with Fawkes in the Harry Potter movies), and the attraction of a phoenix to Credence solves a major mystery. We learn from flashbacks earlier in Fantastic Beasts: The Crimes Of Grindelwald that he was involved in a bit of crib-switching during a boat ride across the Atlantic, but he is in fact Aurelius Dumbledore, the lost brother of Albus, and it is Grindelwald’s intention to use him to kill his sibling (a man that it’s strongly suggested he once loved). This will, of course, be at the center of the future sequels that author J.K. Rowling is in the process of writing and are set to come out in the next decade. 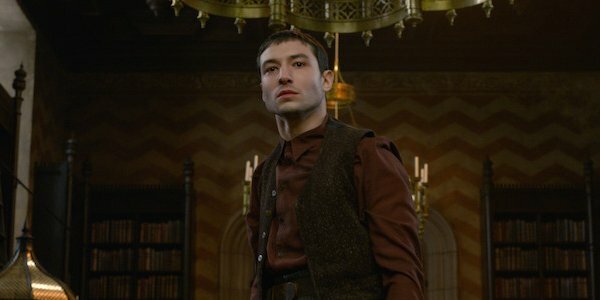 Did you reaction to the big reveal at the end of Fantastic Beasts: The Crimes Of Grindelwald yield for you the same reaction that it got out of Ezra Miller? What did you think of it? How are you expecting it to impact the narrative going forward? What are you excited to see? Hit the comments section with all your thoughts, questions, and ideas, and if you’re already up for a second dose of the movie, it’s now in theaters everywhere nationwide.